Some sinningias go dormant every winter, regardless of climate. Some never go dormant. Others go dormant only if it is sufficiently cold or dark. Diff'rent norms for diff'rent corms. What can I do to make that tuber sprout? A question frequently asked by growers is: "My tuber went dormant last autumn and hasn't sprouted. How can I make it start growing?" Whether a tuber will come out of dormancy is determined at the time it goes into dormancy. If the tuber is not coming out of dormancy, then it is for internal biochemical reasons, and nothing the grower does will change that. We've heard various recommendations, such as immersion in very hot water, or refrigeration (like forcing tulip bulbs). It's hard to test these recommendations objectively, since they require an abundant supply of reluctant tubers. Still, for every success story, there's another saying it didn't work. Several times I have had mature, apparently undamaged tubers fail to come out of dormancy during a summer. The tubers were still alive. I could cut into one and see the fresh green or white tissue within. But no amount of encouragement would cause it to wake up. Only once have I had a tuber sit out a year and then awaken the following year. The tuber didn't sprout in 2007. I was very disappointed, because it was my most picturesque tuber. Here's what I did: I removed it from its pot and set it out in the cold and rain during the winter of 2007-2008. The chilly downpours came and went. 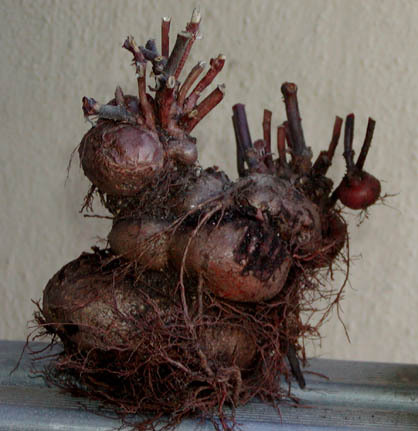 In March 2008, I examined the tuber and saw, from one of its many lobes, a new shoot. This doesn't mean that the cold-and-wet treatment had anything to do with its decision to re-emerge from hiding. The treatment certainly didn't hurt, however. I have left the tuber in its pot, in the potting mix, in a dry location outdoors. I have left the tuber in its pot, in the potting mix, completely exposed to the elements. I have removed the tuber from its pot, cleaned off most of the potting mix, put it into a paper bag, and stored it in a cool dry location outdoors. In the case of small tubers, I have stored the bare tuber in multi-drawer containers sold in hardware stores for storage of things like nuts and screws and nails. These all worked about the same, even #2. If cold and wet killed tubers, then there wouldn't be any potatoes. Only if the temperature is close to the tolerance of a tuber is it possible that being wet will make a difference to its survival. The following photograph illustrates treatment #3. The picture, taken January 2009, shows dozens of tubers individually wrapped in paper lunch sacks, piled up in two Rubbermaid tubs. Each bag is marked with the identity of the tuber, and the plant label is dropped in the bag along with the tuber. 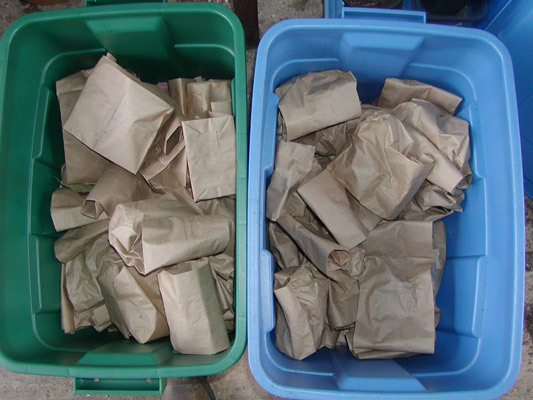 Paper sacks have the advantage that they do not trap moisture, so the tuber will not rot from being too damp and too cold. One might think that a tuber would dry out after several months of no water, but this does not happen. Usually, after four months in the sack, the tuber will sprout even before it is planted. My primary reason for storing tubers this way is to minimize space requirements. Dormant tubers dropped in a tub take up much less room than potted tubers which might need to be protected from rain. JoAnna Behl, of the Peninsula Gesneriad Society, points out an additional benefit of digging up tubers in the fall and planting them in spring. This divides the repotting labor between the two seasons. Watering a dormant tuber is fine. An occasional watering may help to keep it from drying out. What not to do: don't give it any fertilizer! Here's what will happen. The dormant tuber isn't using any minerals from the fertilizer, so they will accumulate in the soil. Then the tuber sprouts, the roots activate, and all those accumulated fertilizer salts get transported to the part of the plant that needs them, namely the growing tip. This results in too much of one or more minerals in the most sensitive part of the plant. The tissues burn and die. Not what you wanted! I have stored some tubers indoors, almost always by removing from the pot and storing them in the hardware box mentioned above. Just one warning: Be careful with the water!. The warmer temperatures indoors seem to make it much likelier for a wet tuber to rot. Here endeth the practical horticulture section. From here on is the uneducated speculation section. Come out of dormancy at the right time. Not come out of dormancy at the wrong time. Getting just one of those right is hard. Getting them both right, with the same system, is really hard! So it should not be any wonder that the system sometimes malfunctions. When the growing tip is removed, it no longer releases its auxin, so some of the buds further down the stem are freed from their chains and start growing. This is why pinching usually encourages branching. The same growth-inhibition works on the tuber too. Most tubers show a lot more shoot buds than actually develop into stems. Somehow the plant knows to let some of them grow and keep some of them inactive. This is probably the same system that suppresses the growth of vegetative buds in leaf axils; the growing stem tips release an auxin which is transported back down to the tuber and keeps the inactive buds from growing. We can see that by removing the active shoots. This takes away the source of the auxin (or whichever hormone is doing the job), so some of the inactive shoots spring into action and begin growing. A growth inhibitor (GI) must be involved in dormancy. The tuber has dormant buds (sometimes they are visible) which must be prevented from growing at inappropriate times. The plant already has a system to keep buds from growing when it doesn't want them to. It is only natural that this same system would be employed to enforce dormancy. Presumably, after the plant has bloomed and accomplished its reproductive tasks for the year, a message goes out from some part of the plant to the tuber, saying "Time to shut down." Where that GI comes from, I don't know, but it must wind up in the tuber, to keep those dormant buds from starting growth when the year's stems fall off. So there we have a dormant tuber: a bunch of starch (mostly? ), chock full of growth inhibitor, slumbering away the scorching heat, or drought, or chilly winter, or whatever it is avoiding. The only question is: what tells it to wake up? Most plants that don't grow right next to the equator get their seasonal signals from day length. Long days = summer, short days = winter. That's how most plants know when to bloom. But that mechanism clearly won't work for tuber activation. After all, how does an underground tuber know how long the day is? We mentioned above that removing the growing tip usually activates dormant vegetative buds further down the stem. This implies that something must be removing GI from the plant tissue; otherwise the effects of the GI would persist even after the removal of the growing tip. It could be that the GI breaks down spontaneously, but that would present a problem for the observed persistence of tuber dormancy. Therefore it is much more likely that some other plant enzyme breaks down the GI. Let's call this a Growth Inhibitor Deactivator (GIDe). Thus the stem tip makes GI, some other part of the plant makes GIDe, but as long as the meristem is active, and the GI gets transported down the stem, there is enough GI to stay ahead of the GIDe. The details will, naturally, depend on the plant. What does this mean for dormancy? There is unlikely to be a constant source for new GI in a dormant tuber. In this view, the tuber gets all the GI it's going to have when it goes into dormancy. Without some spontaneous breakdown of GI, the tuber will stay dormant forever. So we can assume there is a certain amount of GI in the dormant tuber, and a certain amount of GIDe. If the GIDe can disable the GI without being itself consumed (by no means certain) and if the GIDe can be transported through the tuber (also uncertain), the GIDe will eventually consume all the GI, and the new season of growth can begin. This is essentially a timing mechanism. In the dark, the tuber marks time by the GIDe-directed breakdown of the GI. When enough time has passed, the tuber begins its new season of growth. There are at least two problems with this relatively unsophisticated mechanism. The tuber will sprout when a certain amount of time has passed, regardless of whether growing conditions are appropriate. This mechanism clearly cannot explain the revival of bulbs such as tulips, which need exposure to cold in order to begin a new cycle of growth. The second difficulty is worth special attention. All chemical reactions slow down as temperature drops. A period of cold will make the GIDe-directed breakdown of GI run more slowly. How can this be necessary for the revival of the bulb? One possible answer is that there is a third hormone involved. GIDe deactivator (GIDeDe) works on GIDe just the way GIDe works on GI. The only difference is that GIDe keeps working (although more slowly) when the temperature drops, while GIDeDe is much more sensitive to temperature, and pretty much can't function at all when it gets too cold. So here's what might happen when it snows (or you put that tulip bulb in the freezer): the GIDeDe, which had been disabling the GIDe and keeping it from doing its job, goes to sleep itself. This unshackles the GIDe, which goes to work on the GI. If the cold spell lasts long enough, the GIDe breaks down enough of the GI to let the bulb sprout when the ground warms enough (and the bulb has no other source of GI). This Rube Goldberg "triple inhibition" system has just the properties required to explain the behavior of tulip bulbs: the bulbs don't sprout when it's cold and won't sprout if they don't get sufficiently long cold exposure. Instead, they sprout some time after a cold spell. In this way the underground bulb senses the passage of winter and knows when its season has come again. Sinningias are from a family which has some tendency toward underground storage structures, but as I argued on the tuber arithmetic page, Original Sinn probably did not have a tuber. As a result, the sinningia dormancy system may not be as smart or well-regulated as that of tulips. Even so, it is likely to be complex, and to involve, at the very least, GI and GIDe, and probably some more hormones as well. I have guessed that all the GI that the tuber contains was put into it before the tuber went dormant. I have guessed that there is some GIDe-based system to get the tuber out of dormancy, when enough time has passed or when conditions are favorable. I have guessed that there is some system sitting on top of the GIDe system, to make sure that the tuber does not sprout too early. With complexity comes fallibility. The more links in the chain, the more potential points of failure. And my suspicion is that most of the points of failure are in the initiation of dormancy itself. The right amount of GI has to be created. The GIDe system has to be activated properly. If there is a GIDeDe system or something like it, that too has to be set in motion correctly. If any of these systems malfunction, you have Sleeping Beauty without a prince. In 1995, I sowed seed of Sinningia canescens. Due to my cultural shortcomings, my seedling did not bloom until 2000. This is the plant pictured on my S. canescens page. In 2005, its growth was not as vigorous as most years, and I worried about it. In 2006, the tuber did not sprout with the others; eventually I planted it anyway, and within a few weeks, it had rotted. My last remaining S. incarnata tuber went dormant at the end of 2005, and never sprouted again. It still felt firm and looked healthy, but it was done for. I do not know what it needed, but it didn't get it. A lot of work has been done on dormancy control in potatoes. Even so, there still seems to be quite a bit of uncertainty about dormancy release. The auxin hormone indole acetic acid (IAA) is believed to play a major role in ending dormancy in potatoes, and a class of hormones called cytokinins is believed to be important too, because cytokinins unblock the cell division cycle in potatoes which was blocked by tuber dormancy. But there is no guarantee that this work will explain what happens in sinningias. I seem to recall having read somewhere that application of giberellic acid (another plant hormone) was ineffective in releasing sinningia tubers from dormancy. This would be consistent with my belief that tubers which won't break dormancy cannot be induced to do so by external means.